Chef Gerald was fantastic! Our communications with him ahead of time were handled quickly and efficiently. - Chef Gerald prepared our last evening's dinner. It was incredible!!! Elegant and personifying French culinary perfection. Several in the group said that it was one of the best meals they have ever had. And with this group, that is an achievement. Truly a memorable culinary experience!!! (Lucy and I completely agree). We used the chef service and I would highly recommend it. We used the chef service (Gerald) twice. Once for meal delivery and the other for full service. Both experiences were good. Gerald is a nice person and cooks very well. Through Only Provence we hired three different chefs to come to the house and cook for us: Chefs Sophie, Gerald and David. All three were excellent. Our favorite ended up being Chef Gerald who we hired for an additional night. We had a very special and happy holiday, thanks to Only Provence and a good meal from the chef, with generous portions. Chef Gerald prepared a meal for us on the first evening and it was truly delicious – Thank you Gerald! my sincere thanks for the wonderful job Gerald did looking after my group at Le Petit Hameau recently. My group were so happy and have very fond memories not just of the wonderful food but Gerald's lovely personality and excellent service. We engaged Chef Gerald for a cooking class on our third night. Chef Gerald was personable, patient and humorous as he taught all of us his techniques for Provencal cooking with fresh ingredients. We enjoyed a memorable dinner of salad, filet of beef, fresh vegetables and a raspberry tart for dessert. Had a special celebration in August with Chef Gerald cooking us a meal. Taken unawares - had not expected the food to be of such a high standard - absolutely delicious! Menus for the children aimed right. He concurred that the best 'cave' was that of Chateau la Canorgue. Maybe the chef might advise on wine beforehand / or bring some along? Chef Gerald prepared a wonderful meal for us. He gave us clear instructions on how to do simple final preparation to enjoy the cold tomato soup, leg of lamb, and fruit tarte. The portions were plentiful--we actually had leftovers that we were able to enjoy. 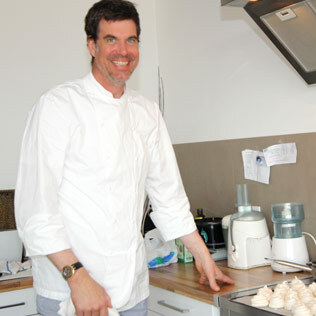 Chef Gérald performed a feat of magic in our house kitchen that still has me in awe as I write - an absolute gem, kind, funny, and a truly excellent chef. Chef Gerald's visit was a highlight. He was so much fun and cooked us a delicious sea bass dinner. The chef, Gerald, was wonderful--5 stars! He prepared an extraordinary meal and explained everything in French and English. He brought all his own utensils and serving dishes and cleaned up everything. The food was superb. It was a delightful experience. We would definitely recommend the villa, the chef and the wine tour to others. The Chef service was excellent. We highly recommend Chef Gerald , the food was amazing . We had an absolutely wonderful evening with chef Gerald and I will be writing to him directly to let him know how happy we were with the whole experience. He's such a great chef and a very personable man who was very patient with us. The food was delicious. Just to let you know we had Gerald cook dinner for us tonight and it also was amazing. especially one guest who is vegetarian. We needed more instructions for the first casual meal, we struggled to cook the lamb. friends agreed that we had not eaten so well.